Using very fresh, raw green pistachios will ensure a soft, naturally green color unlike any commercial pistachio ice cream you’ve ever seen. Scald milk; pull from heat and stir in sugar and salt, blending well. Allow to cool slightly. Add cream, half and half, pistachios and vanilla. Chill 8 hours or overnight. 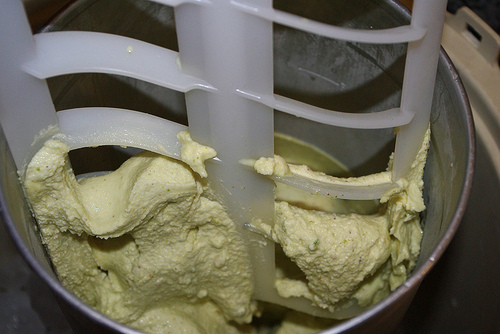 WIth a fine mesh strainer, strain pistachios from ice cream mixture, pressing to ensure all liquid is removed. Discard all but a strong quarter cup of pistachios (if you like a little texture). Stir in pistachios. Freeze according to your ice-cream maker’s directions.